A bathroom remodel is a popular home improvement project. ProSource® of Mobile understands this well, which is why we house bath remodel products from the industry’s top brands. Find faucets, sinks, showers, vanities, tubs and toilets that make any bathroom renovation as enjoyable to view as the space is to use. ProSource is the source for bathroom project success. Bathroom sinks may serve a distinct purpose, but they can do so with panache. 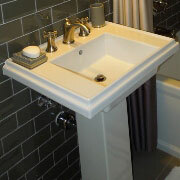 Today’s sinks come in numerous styles such as vessel, pedestal, and wading pool. Materials vary from cast bronze to fireclay to glass and more. Add the shapes and sizes available and each bathroom sink becomes unique for the space. Peruse the vast selection of sink faucets to find the perfect addition to the sink. Color finishes range from brass to nickel to chrome (and much more), while handle types include cross, knobs, levers and more. 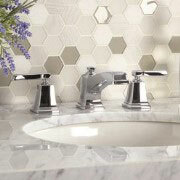 In all, bathroom sink faucets provide a little flair to a remodeled space. A shower is a defining feature of any bathroom, with multiple parts that work in harmony such as the shower head, handles, base and door. Today’s showers have become a sanctuary to get clean and wash away the day’s worries. 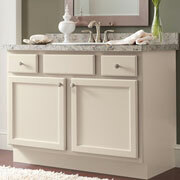 Vanities offer storage, counter space, a preparation area, and, last but not least, character to a bathroom. Whether the space is large or small, traditional or modern, ProSource is the source for vanities for any bathroom remodeling project. 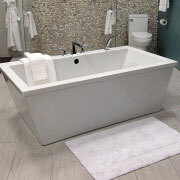 Tubs offer the opportunity to bathe in luxury. Selections include various styles (from jacuzzi to claw foot) and features (colored water and programmable music). Then again, perhaps simple functionality is what’s desired. No matter, as there’s a right choice that’s sure to please. Toilets can complement the design and tone of any bathroom remodel. 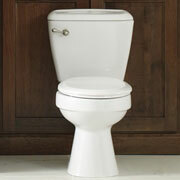 Choose from a standard toilet to eco-friendly flush options, in styles from traditional to contemporary. Today’s selections are flush with options.